Construction of the blade begins by forging layers of stainless steel together. 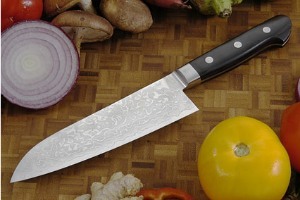 This time consuming process creates a Jigane (the outside layers of the blade) with a beautiful Damascus pattern. 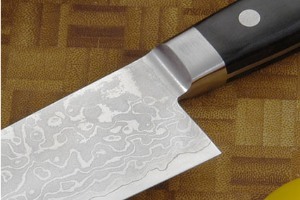 The maker then begins preparation of the Hagane (the middle layer of the blade) by forging high carbon stainless steel, alloyed with cobalt. The basic construction of the blade is competed by forge-welding the Hagane between two layers of Jigane. Following in the best tradition of knife making, a steel ferrule is forge-welded to the tang to ensure that food particles can not become lodged between the tang and the handle. The handle, made from multiple layers of wood impregnated with resin, is riveted to the full length tang and will last a lifetime. It has been nicely rounded and feels very comfortable when held. The blades are fully honed. 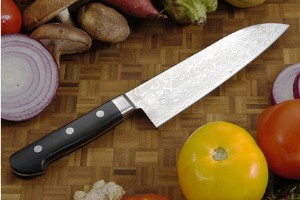 Knives come packaged in a special gift box.